Trends in transportation have drastically changed the American landscape and way of life over the past century. Americans are confronted daily with the decision of how we will get to where we need to go, whether it be to work, school, shopping, childcare, or to doctor appointments. Transportation uniquely effects rural Americans faced with longer travel distances and limited public transportation options in their communities. "Where Do Houston County Residents Work & how do they get there?" Tiffany set out to explore the rural transportation issue from the local worker-commuter perspective. She interviewed residents, including her family members and neighbors, in the Spring Grove area. Her project is comprised of two main components: first, an audio documentary (right!) that shares the story of rural transportation in human terms; second, a collaborative story map rich with data pertaining to working and commuting in Houston County (below). 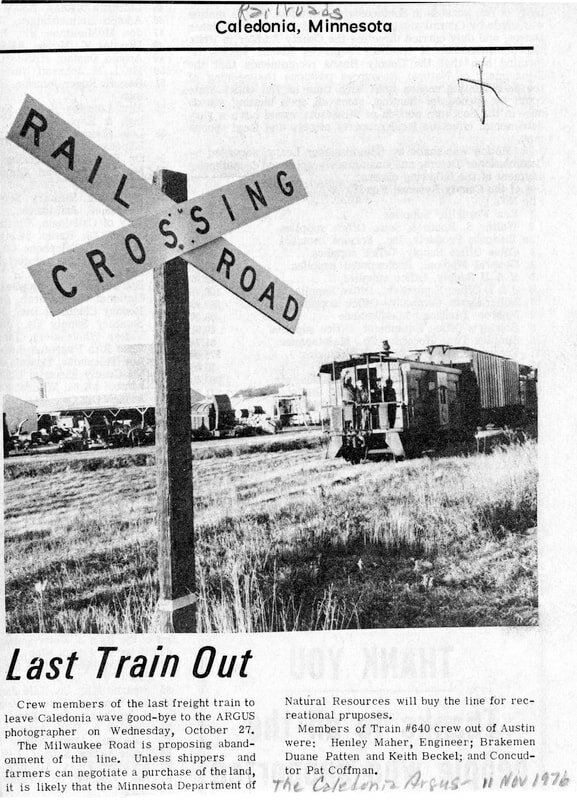 At the Houston County Historical Society archives, Tiffany located several articles and images detailing the county's rich rail history. 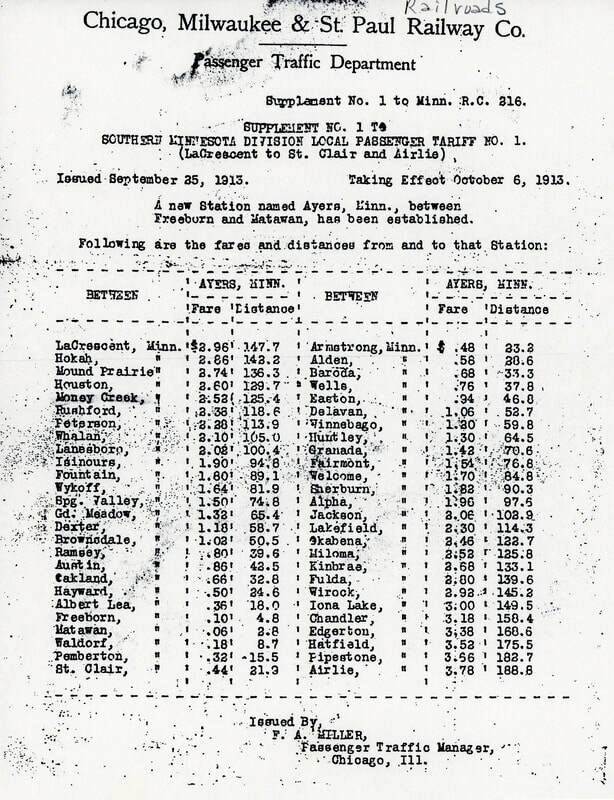 The "Milwaukee Road" (Chicago, Milwaukee, St. Paul Railroad) ran across the northern part of the county along our Root River, and today's Highway 16. Additionally, passenger trains connected people in our small towns until the rails were retired in the 1960s and 1970s and we transitioned into a modern bus system. Our guide at HCHS, Deb Wray, recalled regularly catching the bus in Caledonia in high school to travel from town to town. It was a great transportation option for young people without a license or their own vehicle. 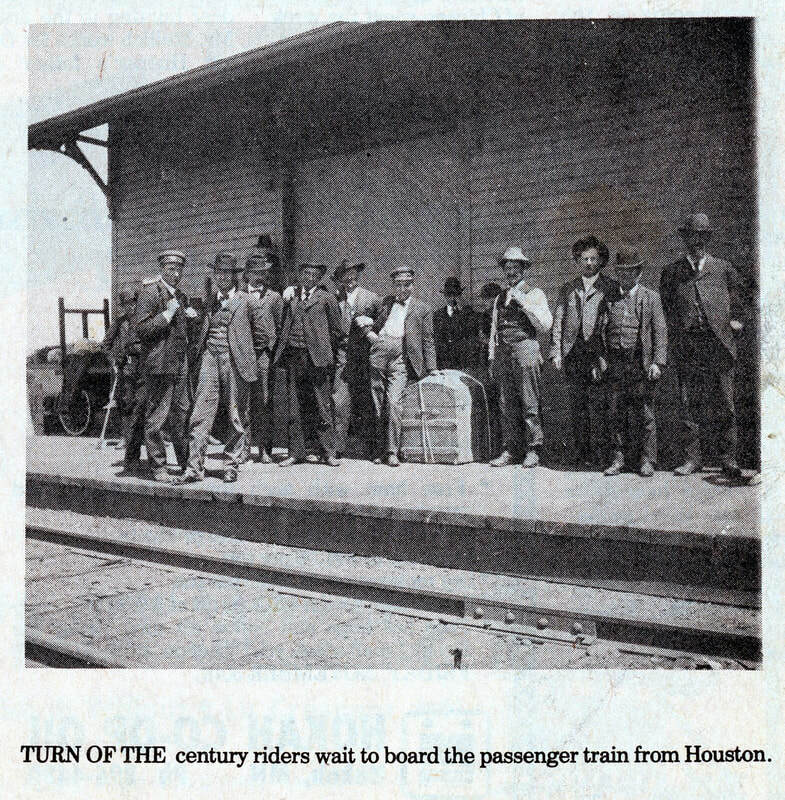 Today, both passenger trains and buses are no longer in service, leaving many Houston County residents with a growing rural transportation crisis. While some citizens Tiffany spoke with have formed their own rideshare programs to support friends and family in need of transportation, only one or two private transportation services for the elderly have been established. For commuting workers, MNDOT has a few designated Park & Rides available, yet most systems remain informal, or nonexistent. It is the hope of the Stories: YES Houston team that this project may spark a conversation within the county about transportation needs, and through a collaborative dialogue, arrive at new solutions to solve our crisis. 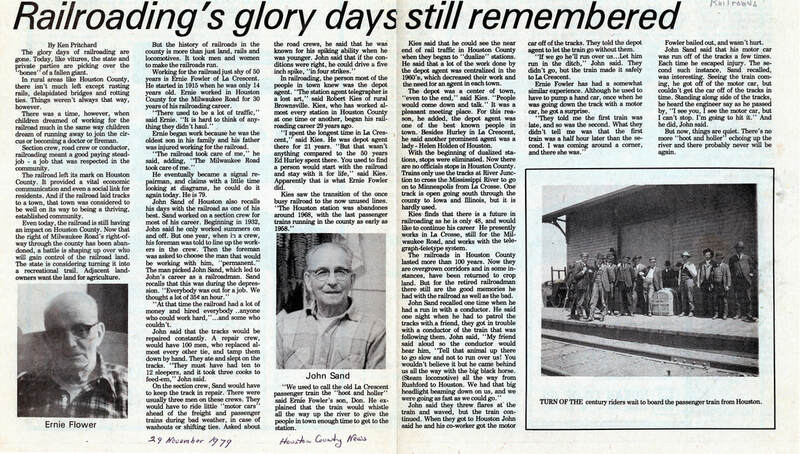 In the video below, Tiffany reads excerpts from the 1979 article, "Railroading's glory days still remembered," featuring archival footage of the Milwaukee Road in 1946. Click on the image to read the full 2014 article. 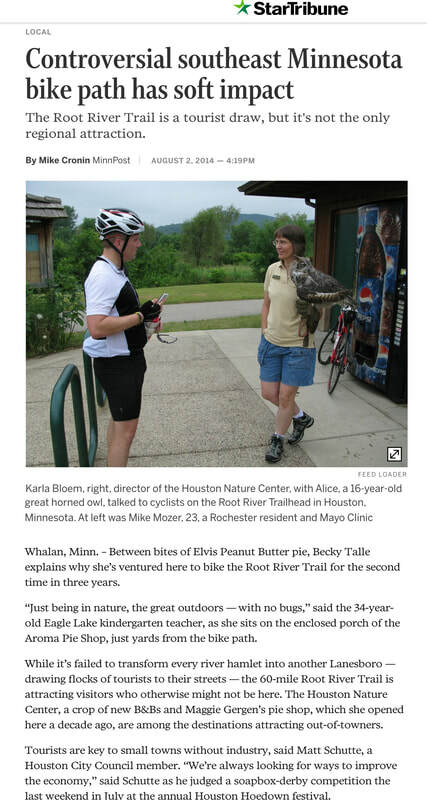 want to know more about the Root River bike trail? with the transformation of the Root River State Trail, from railroad line to outdoor recreation attraction. Lanesboro and its thriving arts community are highlighted as a model for economic regeneration in other small towns, especially those in Southeast Minnesota. Story map: Transportation & Rural workers in houston co., minn.
What follows is the result of collaboration took place between Tiffany and Ian Ehrnstrom, a graduate student at the University of Wisconsin - Milwaukee studying geographic information systems (GIS). Through mapping and data analysis, he provides a regional context to the issues that rural Houston County commuters face. Within this context, Tiffany's story is able to come to life as from the hard data emerge the real-life stories of Houston County residents. Explore the map for a detailed look at the issue of rural commuting for Houston workers.